Provided photo The Tipp City Seniors inc. elected their officers for 2019. Pictured from left to right: Sharon Dehus, President; Dee Gillis, Treasurer; Mara Demers, 1st Vice President; Ruth Reinhard, Jr. Past President; Marge Jordan, 2nd Vice President; Sue Twehues, Trustee; Jo Hopper, Corresponding Secretary; Carol Morgan, Trustee; Larry Boze, Trustee; and John Berk, Trustee. Not pictured Janice Long, Secretary; Barb DeAngelis, Assistant Treasurer; and Carol Huelskamp, Trustee. 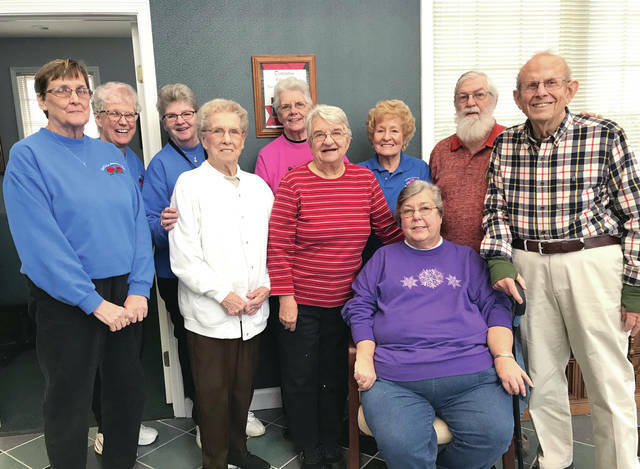 The Tipp City Seniors inc. elected their officers for 2019. Pictured from left to right: Sharon Dehus, President; Dee Gillis, Treasurer; Mara Demers, 1st Vice President; Ruth Reinhard, Jr. Past President; Marge Jordan, 2nd Vice President; Sue Twehues, Trustee; Jo Hopper, Corresponding Secretary; Carol Morgan, Trustee; Larry Boze, Trustee; and John Berk, Trustee. Not pictured Janice Long, Secretary; Barb DeAngelis, Assistant Treasurer; and Carol Huelskamp, Trustee. https://www.weeklyrecordherald.com/wp-content/uploads/sites/51/2019/02/web1_IMG_7983.jpgProvided photo The Tipp City Seniors inc. elected their officers for 2019. Pictured from left to right: Sharon Dehus, President; Dee Gillis, Treasurer; Mara Demers, 1st Vice President; Ruth Reinhard, Jr. Past President; Marge Jordan, 2nd Vice President; Sue Twehues, Trustee; Jo Hopper, Corresponding Secretary; Carol Morgan, Trustee; Larry Boze, Trustee; and John Berk, Trustee. Not pictured Janice Long, Secretary; Barb DeAngelis, Assistant Treasurer; and Carol Huelskamp, Trustee.